Here, we report a long-distance interaction (LDI) as a critical regulator of alternative splicing of Survival Motor Neuron 2 (SMN2) exon 7, skipping of which is linked to spinal muscular atrophy (SMA), a leading genetic disease of children and infants. We show that this LDI is linked to a unique intra-intronic structure that we term internal stem through LDI-1 (ISTL1). We used site-specific mutations and Selective 2′-Hydroxyl Acylation analyzed by Primer Extension to confirm the formation and functional significance of ISTL1. We demonstrate that the inhibitory effect of ISTL1 is independent of hnRNP A1/A2B1 and PTB1 previously implicated in SMN2 exon 7 splicing. We show that an antisense oligonucleotide-mediated sequestration of the 3′ strand of ISTL1 fully corrects SMN2 exon 7 splicing and restores high levels of SMN and Gemin2, a SMN-interacting protein, in SMA patient cells. 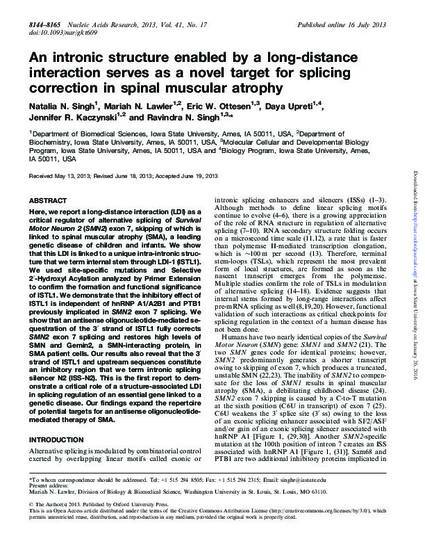 Our results also reveal that the 3′ strand of ISTL1 and upstream sequences constitute an inhibitory region that we term intronic splicing silencer N2 (ISS-N2). This is the first report to demonstrate a critical role of a structure-associated LDI in splicing regulation of an essential gene linked to a genetic disease. Our findings expand the repertoire of potential targets for an antisense oligonucleotide-mediated therapy of SMA. This is an article from Nucleic Acids Research 41 (2013): 8144, doi:10.1093/nar/gkt609. Posted with permission.